How did we approach the problem of making TV Actor data tell a story? Nathan’s dataset was neither very rich (just actor name, type of show, and salary) nor very large (72 actors were included). Fortunately, the two weaknesses combined to be a strength; it was easy to hit IMDB and fill in essential missing details. We added show name, network, average IMDB rating, and gender. Here’ is the updated data set. What information is most interesting? You can never go wrong focusing on the war between the sexes. We wanted to let people see the data in many different ways while always being able to easily tell the difference between men and women. 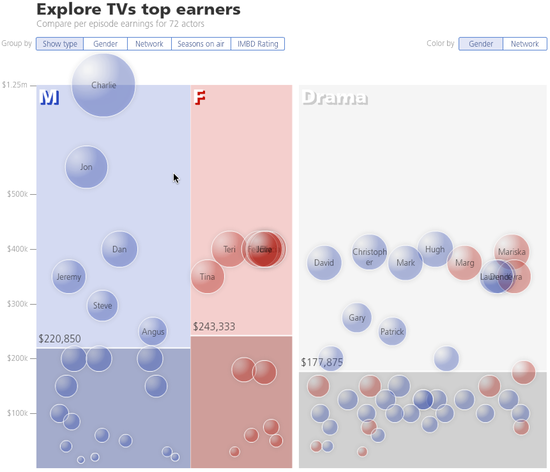 We also wanted to show both averages and detail to let you see which actors are driving those averages. When designing the Explorer we were inspired from David McCandless and Andy Perkins’ “lava lamp” visual exploration of scientific support for medical supplements. Our visualization is a simplified version of a typical bubble chart, but eliminating positioning along the x-axis as a indicator of value. Interestingly, this simplification opens up possibilities to use that axis in new ways. We could now split the chart horizontally to show dimensions such as show type, gender, and network. 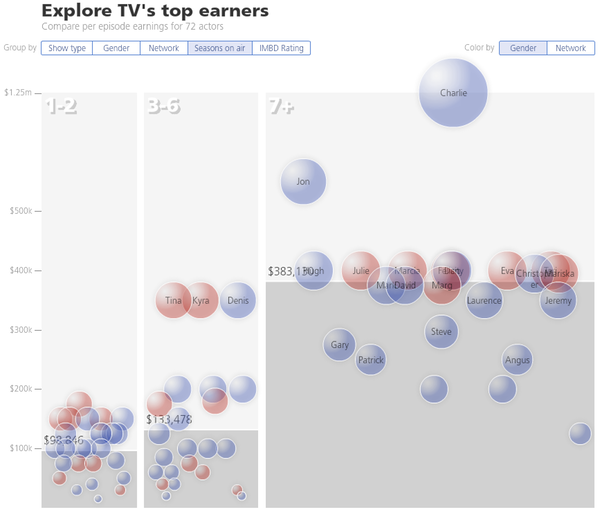 The bubbles were placed on top of a horizontally scaled bar chart that showed the average income for the group. The width of the bar depends on the total income of the group. 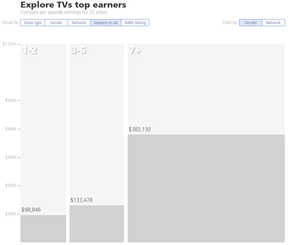 Here are the two visualizations seen separately. Salaries were scaled vertically from $0 to $700k with Charlie Sheens bubble protruding assertively out of the top of the frame. Steve Jobs is famous for ending presentations by showing “just one more thing”, then socking his audience with some unbelievably cool new feature. 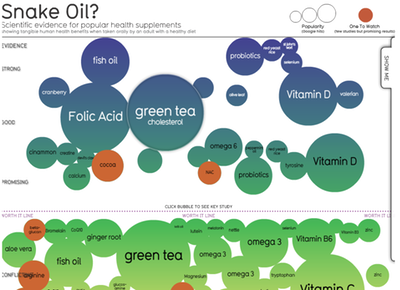 We wanted this visualization to have that same sense of surprise and discovery. If you hold down the mouse button on any group, the bubbles part to reveal the Male/Female breakout of average salaries within that group. 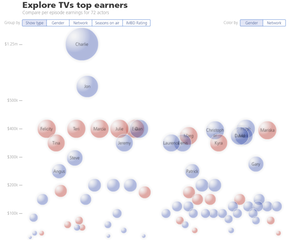 With richer data and a flexible visualization, we found some interesting stories in the data. Why does Charlie Sheen get to demand a raise from his reported salary of $1.25 million per episode while that amiable fellow Matthew Morrison from hit show Glee make a piddly $30,000 per episode? When we break the chart out by “seasons on air,” it is clear that as a show ages, the actor’s ability to capture more value increases. Presumably the risk of the show failing declines—and the actor’s bargaining power improves. Charlie Sheen has spent the past few weeks testing this hypothesis. If this sort of thing interests you, perhaps we can help you with your dashboard and data display problems. Newer PostIs Luck a Skill?